The secret is out! Norman’s has introduced a world first Cholov Yisrael yogurt that doesn’t lose its probiotic efficacy over time. Greek Pro+ yogurt with active live probiotic cultures has essentially changed the dairy market forever. Probiotics (beneficial bacteria) play an important role in supporting digestive and immune health. Consuming probiotic foods on a daily basis helps restore them, leading to improved overall health and well-being. However, most live probiotic cultures diminish and die over time, so by the time you’ve open the package there is only a fraction of the active cultures left. 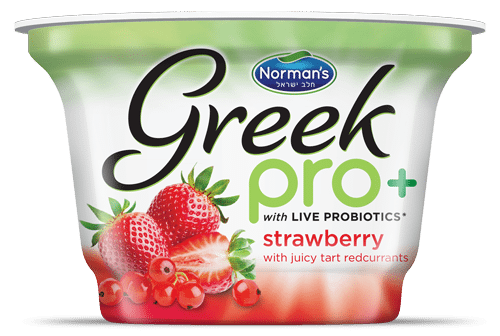 Norman’s Greek Pro+ is the first Greek yogurt ever to contain GanedenBC30 Probiotic Culture that guarantees an efficacious dose of probiotics from the moment the cups are filled, until the yogurt reaches the eater’s mouth. What’s more – GanedenBC30® is supported by rigorous safety and efficacy research. This means that with a concentration of 1 billion CFU’s per cup it actually does what it claims, supporting digestive and immune health, as well as protein utilization. Naturally sweetened with Stevia and free of artificial color or flavoring, Norman’s Greek Pro+ comes in four mouth-watering flavors – blueberry, acai & pomegranate, roast coffee, vanilla bean, and strawberry redcurrant. Get the ultimate probiotic yogurt – ALL ACTIVE, ALL ALIVE, ALL THE TIME!